Gwen and Max are members of Bethlehem Lutheran Church. They are in their early 70’s, and they are enjoying their children and grandchildren in their retirement. They didn’t imagine that Milestones Ministry would have much of an impact on their lives. The impression for many of their generation was that their milestones in life were behind them, especially because many of the Milestones and Blessings seemed to fit families with children at home. 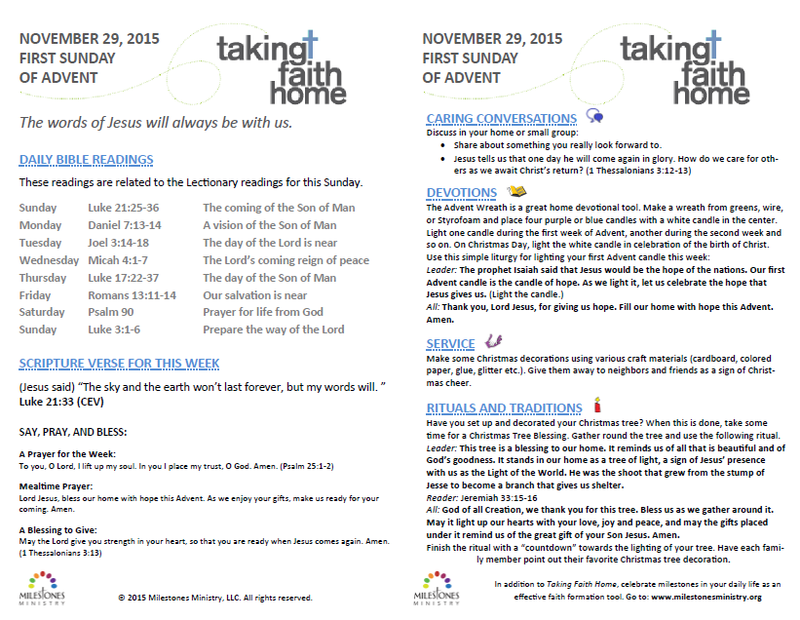 The congregation provides Taking Faith Home weekly inserts in the bulletins, and we encouraged people to take them home and use them in their personal and family devotions. So, Max and Gwen took their insert home. Previously, they had a practice of daily devotions, but they did them individually with different devotional materials, but they tried having their devotional time together using Taking Faith Home. Gwen and Max were delighted with their new faith practice. They had conversations about faith that revealed important thoughts and feelings that they hadn’t talked about before. They discovered the significance of forgiveness in their lives, and how much the forgiveness they had given each other over the years meant to them. They found that these conversations opened new aspects of their relationship that they had assumed, but hadn’t really celebrated. They were surprised how reading and talking about a scriptural text added so much. It added a slightly different perspective to the text from someone whose faith they respected and who was more insightful than they had expected. They claim that a whole new part of their lives have been available to each other now, and they are closer than they have ever been before. They are utterly convinced that home is church, too, and that Milestones Ministry is for them.